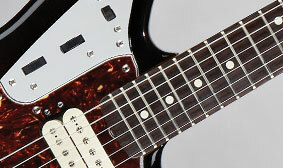 For the modern guitarist who wants a classic Jaguar with extra power, the Classic Player Jaguar Special HH updates the timeless instrument with several thoroughly modern appointments. With great Classic Player sound and style, these include two hot humbucking pickups, special non-traditional switching and circuitry, an Adjusto-Matic™ bridge, a neck pocket with increased back-angle for improved stability and sustain, and more. Not too short, not too tall. Not too wide, not too narrow. 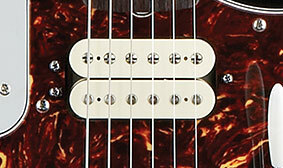 On a guitar fingerboard, medium jumbo frets are the "Goldilocks" size—just right for any sound and playing style. 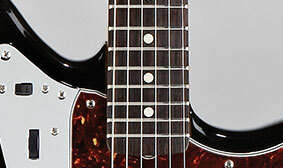 The fingerboard radius is an important spec that describes the amount of curvature across the width of the fingerboard. 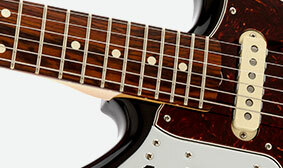 This instrument’s modern 9.5" fingerboard radius is slightly more flattened than a vintage-style radius, but still with enough arc to provide a natural and notably comfortable fretting-hand feel, and to make bending notes easier. For notable string placement and tuning stability, this instrument features an Adjusto-Matic bridge, along with a vintage-style "floating" tremolo tailpiece and tremolo lock button for an added touch of original-era authenticity. 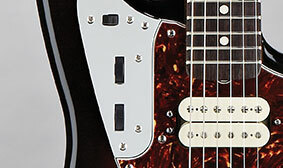 For hotter sound with more output than traditional Jaguar bite, this amped-up Classic Player model features two powerfully voiced Special Design Hot single-coil Jaguar pickups. For optimal bridge and tremolo performance, this Classic Player model actually improves on the original models with a slightly more pronounced neck angle produced by a new neck pocket cut. 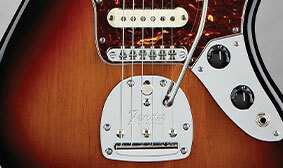 Along with a more pronounced neck angle, bridge and tremolo performance on this instrument are improved by moving the tremolo plate slightly closer to the bridge. This increases the string-break angle for more stable string placement, and reduces the string length behind the bridge to lessen or eliminate unwanted sympathetic vibrations.